Offering best performance for most critical process monitoring requirements in areas where explosive conditions exist, Videotec’s MAXIMUS range is the perfect choice for video surveillance for the oil, gas and chemical industries. These products can be installed in the harshest conditions: they are characterized by sturdiness, rugged construction and low maintenance and their quality level exceeds all expectations. The MAXIMUS range features stainless steel integrated positioning units, designed for demanding applications in accordance with the strongest standards for environments where there is a risk of explosion. 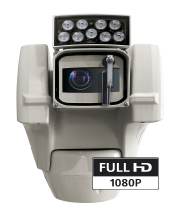 The High speed pan & tilt cameras are capable of 100°/s with continuous rotation and are available in several versions equipped with day/night CCD sensor and up to 36x optical zoom or day/night CCD sensor and up to 36x optical zoom and a thermal imaging sensor, for real time dual vision in the complete darkness. All MAXIMUS pan and tilt cameras can be fitted with a number of additional features, including a cleaning wiper, a thermostatically controlled heater, PAL/NTSC analogue or IP MPEG4 video output and an optical-fibre transmitter. These products are made of electro-polished AISI 316L stainless steel, which has excellent resistance to saline mist and atmospheric pollutants. The MAXIMUS range is recommended for installation in highly corrosive environments with explosive risk, such as oil refineries, petrochemical plants and offshore facilities. Videotec has a strong background in these areas, and many installations use its products.